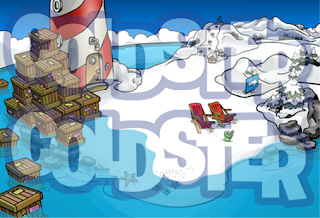 Cold Dude Computers: Club Penguin: More Boxes at the Beach on 24th! Club Penguin: More Boxes at the Beach on 24th! I have an exclusive for you! On the 24th, which is Tuesday, more boxes will be released on the beach! Take a look! Are you exited for the Underwater Expedition? Oh yeah, before I forget, Rookie will have a new BG called, ' Rookie Anvil BG '. Have a good day!